Background: Wind is the movement of air. The air moves because of differences in temperature caused by the sun heating the earth. One of the ways children learn that air exists is by seeing evidence of its movement. In addition to watching the movement of flags and tree leaves, allow children to explore air movement themselves. Give each child a feather or piece of tissue and allow them to blow on it. Let them free explore, seeing how the feathers lift and fly as the air moves. When they are finished, turn on a fan. Allow them to drop their feather in front of the fan. Does the feather move differently? (An actively working air return vent can also work if you don’t have a fan). 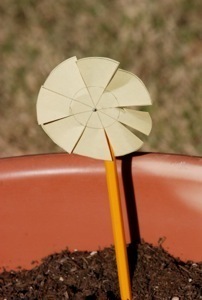 Here’s a way to make a simple pinwheel. Have and adult place the pin through the center of the pinwheel and push into the side of the pencil eraser. The pencil will be the handle. Be careful with the pin around small children. Play the modeling clay over the sharp end of the pin to hold it in place. Now gently bend one corner down on each wedge, making sure to create the same angle with each. Blow on your pinwheel or push it through the air holding the pencil. It should spin as the air hits it.